Take a spin with this classic tween game if you dare! 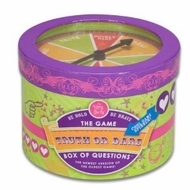 The Truth or Dare Box of Questions makes an awesome birthday gift or can be sent off with your camper! Warning! This game may cause watery eyes and side cramps from way too much laughter! !